I do love a good pot of hot noodles with a spicy sauce. I like to boil myself some eggs to have on the side and also dip some bread and butter into the pot to soak up the sauce. I've had a few particularly explosive experiences with Fusian before. Namely trying to cook their noodle packets without them boiling over in our dodgy old microwave. To be honest there has been absolutely no success there whatsoever and it usually takes quite a while to clean the microwave afterwards. Part of that time taken is me begging Cinabar just to buy another microwave! This Maggi Fusian Sweet Chilli Noodles is finally in a pot. I'm not sure how long they've been out, but whoohoo! Now I get to add boiling water rather than stare at an overly bright TV dinner until it explodes everywhere when I blink! On opening the pot there was two sachets; one for seasoning and one for diced vegetables, such as carrot, leek, onion, parsley, and chives. These two sachets were sitting on top of a solid block of stringy noodles (I'm sure they're not called that, but whatever!). I'd take a photograph of the contents, but believe me they're not that interesting. No bendable plastic fork under extreme temperatures either… which was slightly disappointing. I always enjoy putting that in recycling and finding a metal fork from the draw! After adding the contents of the sachets into the pot and adding boiling water, as well as boiling some eggs, and buttering some bread, this reddish coloured Fusian Sweet Chilli Noodles looks pretty packed full of diced vegetables. 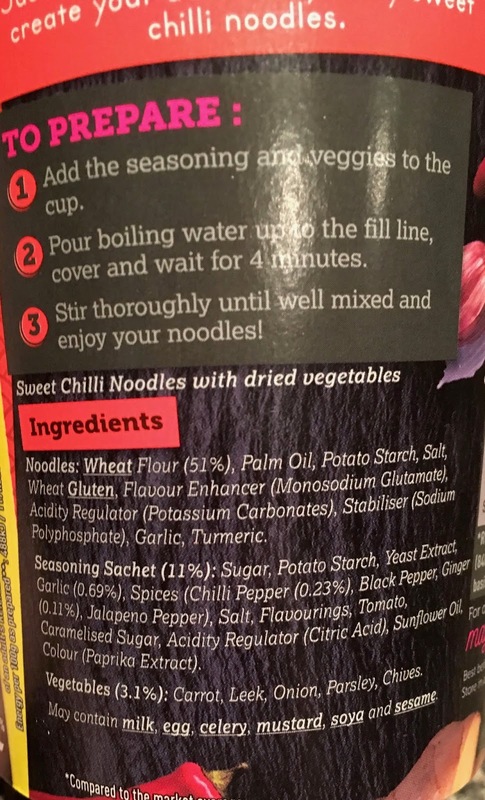 It smells like a mild sweet chilli, no nose tickling chilli burn here, just a gentle tasty smelling noodle pot. On taste there is something very different about this Fusian Sweet Chilli Noodles than any noodle pot I've tasted before. It's the caramelised sugar. It really complements the warming spices and chillies, and peppery flavours. Caramelised sugar is the predominant flavour here and makes every medium chilli hot and sugary sweet mouthful absolutely delicious. 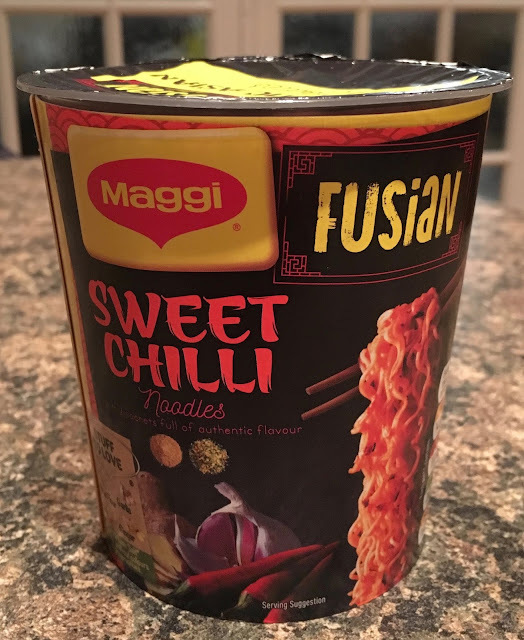 I'll definitely be having these Fusian Sweet Chilli Noodles on a regular basis with my other favourite noodle pot varieties! Each 64g pot contains 307 calories, 14.2g of fat, 3.8g of sugar, and 1.08g of salt. There are no artificial colours or preservatives, and it states there is 25% less salt in this product. See photograph for ingredients.